"A single large cube, with solid edges, rotates in 3-D. As it rotates, it slowly breaks up into 25 embedded cubes each starting at the same center point but moving slowly towards their positions on a 5x5 grid. 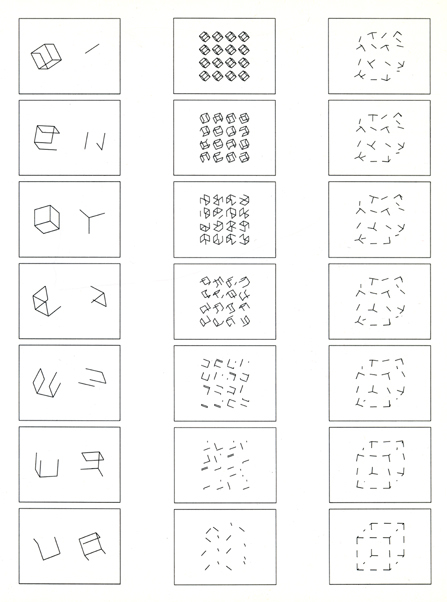 At the same rate, they are shrinking in size so that they fit onto the 5x5 grid as non-overlapping cubes.." more info about Cubic Limit here. "The earlier 16mm film (around 4 min), 'Square Roots' (1972-1973), was my first attempt to make a computer movie. I abandoned this short film because I felt it was too narrative. Subsequently I made the more abstract film 'Cubic Limit' (above). Nevertheless, although unedited, this is a short amusing film which has some of the 2-D elements which I later used in 'Cubic Limit' in 3-D."
"This short 16mm film (around 1 1/2 minutes) is 'Transition I' (1972-1973). As an inauguration gift, I transformed a sketch of the new city hall into the coat of arms of my hometown Pforzheim. Images from this film are published in the book: Pforzheim 1973"
"This very short footage (around 1/2 minute) from 1972 is a study of a cube transforming to random points and back." "This footage 'Complimentary Cubes' (around 5 1/2 minutes), from 1973 - 1974, was originally written for the film "Cubic Limit" but was not used in the film. It shows 2 sequences of all the combinations of 2 rotating cubes, one with 'n' edges and the other with '12 minus n' edges. 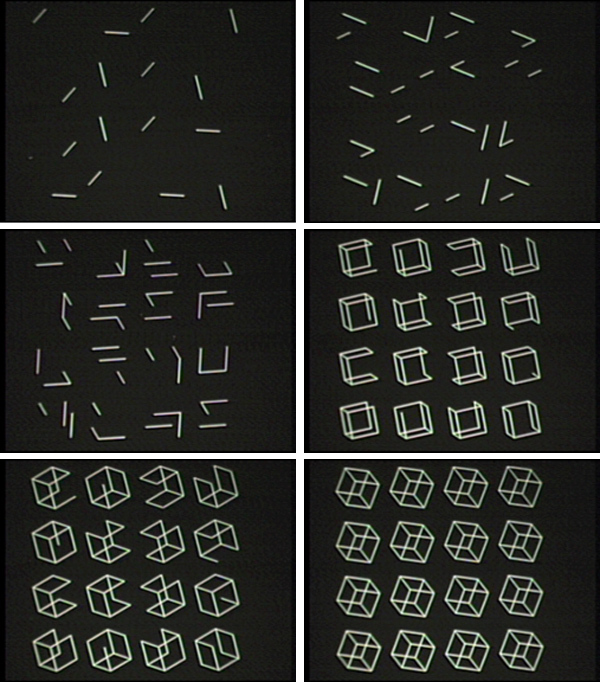 Images from this film were published in the catalog "Cubic Limit", 1975."